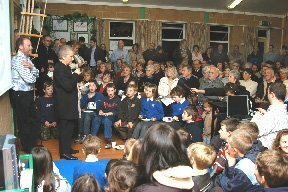 Ashton Hayes Village Hall. Photo by Jonathan Thacker. 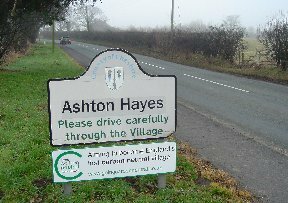 In the last ten years, the village of Ashton Hayes in Cheshire, England with a population of 936+ has taken on climate change by becoming carbon neutral. So far it has reduced its carbon emissions by 24%. To accomplish this, it adopted apolitical, voluntary self-governance—and combined it with a bit of fun. “We just think everyone should try to clean up their patch. And rather than going out and shouting about it, we just do it.” Rosemary Dossett is talking about climate change. One of their secrets was not asking for help from the government or having sit-ins to make the government pay attention. The people of Ashton Hayes took charge and began meeting together to combat climate change on their own. Moment to moment. Day to day. One home at a time. Voluntarily. No regulations. And with a light-hearted view of the end of the world. 650 people attended the first carbon neutral meeting. Only 400 could fit inside. The others waited outside for a second presentation. No politician has ever been allowed to address the Ashton Hayes group. As the villagers said, involving the government would introduce party politics and divide the group along ideological lines. This a rather negative comment on government but exactly right. A government based entirely on “the majority decides” develops strong sub-alliances to amass enough votes to become the majority. This leads to vote-trading that has little or nothing to do with purposes. Ashton Hayes avoided this by identifying their purpose clearly as going carbon neutral and focusing their attention on that, not whose approach would win. Install an electricity-led sustainable biodiesel CHP boiler in the school. Roy Alexander, a physical geologist and professor of Environmental Sustainability at the University of Chester is supporting the effort. He teaches sustainability for Community and Business and consults with communities on carbon emissions reduction. A surprising 650 people, two-thirds of the village population showed up to the first meeting. And 99.4% of the population is now participating. At whatever level of participation each resident is achieving, these are stunning figures. Could you get two-thirds of your community to attend a meeting on climate change? There is no finger-pointing or guilt tripping. And no doomsday scenarios that would be overwhelming and trigger avoidance. The village focuses on understanding what could be with simple habit changes and better technology. “Some of the changes are so easy, just put on a sweater instead of turning on the heat.” And plant trees to soak up carbon dioxide. Some have converted cottages into energy-efficient homes with triple glazed windows, photovoltaic cells on the roof, and geothermal heat pumps. Underground cisterns collect rainwater that is used for toilets and watering the gardens. The whole village is now punctuated with wind turbines and solar panels. But their greatest success from the sociocratic point of view is assuming that self-governance can work, being practical and non-judgmental, and being inclusive. Accomplishing their goals. And becoming an example for small towns that are now flocking to Ashton Hayes to find out how they did it. The full story of Ashton Hayes’ progress is chronicled on the Ashton Hayes Going Carbon Neutral including data sheets, videos, behavior surveys, etc. English Village Becomes Climate Leader by Quietly Cleaning Up Its Own Patch by Tatiana Schlossberg. Posted online 21 August 2016. 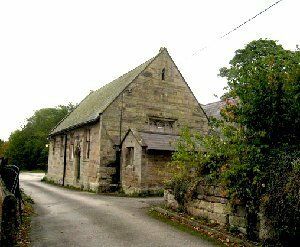 The Wikipedia article, Ashton Hayes, includes links to many related websites and more information on the village. Thank you very much. The digital edition was a new experience. I understand that many people not only like digital editions but they are much less expensive than shipping print copies. If you have any suggestions, please let me know.